Lollipops are essentially hard boiled Sweets that are made using a solution of sugar corn syrup and then tipped into moulds ready for shaping into the desired end product. Lollipops have come a long way from kids and adults seeing them in jars of sweets as far as the eye can see in a traditional sweet shop. Nowadays you tend to buy them in multipack bags with the traditional sweet shop now being more and more uncommon. We sell a range of different Lollipop products across a range of different flavours including Bakewell Tart and Banana Split from our Dobsons brand. We also have a range of many novelty sweets such as The Funny Face Light Pops and the Gator Chomp Pop. 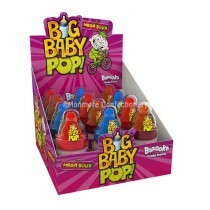 Whatever you are looking for in our lollipops range you are sure to find it at wholesale prices.